It was quite an experience for me traveling home to Wewak for a well deserved break from reporting stories from petty crimes to housing issues and road accidents which have dominated news out from Lae. Going to Wewak an travelling by road to Pagwi where I was suppose to get on an outboard motor and travel up the Sepik River to home sweet home Aibom - an island in the Chambri Lake. Accompanying me on the trip was Post Courier reporter Frankiy Kapin who was assigned to cover the aftermath of the Kadawar Island volcano, which occurred three weeks earlier. I decided to stayed on in Wewak and follow Frankiy on his news trips. That is when we met NBC East Sepik Journalist Edward Hagoria who introduced us to several of his contacts in Wewak and soon we were on the trail of news hunting. I wasn't pretty much sure where to go in Wewak having spent most of my life growing up and working in Lae. The rest was history, we covered news, filed stories for radio and television and Frankiy did the same for print media. What amazes me more is the reception we received from the management and staff of NBC in Wewak. It was totally different and everything you would see in NBC East Sepik weren't what I saw in all other provincial radio stations across Papua New Guinea. Anna Klawe is the Director Provincial Radio (DPR) for NBC Wewak. She heads a small team of officers predominantly women. They are; Johanna Sidney (executive Producer radio), Kimela Baloiloi (Broadcaster), Eugene Sami (Broadcaster Achivist), Ruth Maino (Broadcaster) and Edward Hagoria (Journalist in Charge). Since the first day I stepped into the office, everyone was on their computers working. There were compartments in the main office, no internet (nothing fancy like what we have at NBC Morobe) and the office was clean and welcoming. The toilets were clean (they didn't have a cleaner) and smells better than most hotels in Lae and Port Moresby. There was kitchen was equiped with cooking utensils and stocks of rations bought by the staff for their lunch and dinner. I entered the studio, wow it was amazing and very relaxing. We weren't allowed to wear slippers and shoes into the studio. Tables, microphones and headsets weren't too fancy, but were carefully looked after for some decades. The good old turntables and tape players and recorders were all in good working condition. The next place I went in was the technician's room, things were well placed and even the radio and television broadcast were crystal clear. There was also a television screen outside the office and an amplified speaker where those at the reception and waiting area can listen to the broadcast. The radio broadcast covers all of East Sepik reaches as far as Enga, Western Highlands, Madang and West Sepik. What really caught my attention was the NBC vehicle bought by the provincial government some five years back. It was still in good condition. Johny the hardworking driver is someone whom you hardly see sitting around doing nothing. When there's no news runs, he is cleaning the vehicle or mowing the grass around the office. Not to mention he's a very good chef, he cooks rice, kaukau and fish for lunch and dinner at the office. I felt at home and finds it more relaxing since I moved in to assist Edward to file for radio and TV news. Despite the setback and luxury of no free internet, we feel obliged to pay for own our own credits and data to send stories, simply because everyone in there loves their job. Broadcast officers work seven days a week and there are no excuses for missing your shift - even they dont live at NBC houses. One day as we were returning from a trip to Maprik Secondary School, Johny (NBC driver) slowed down somewhere between Koikin and Kreer and asked me and other colleagues to bow our heads and he prayed thanking our good Lord for his guidance and blessings throughout our day;s assignment. I was amazed as he praised the Lord in his prayer about the good things the Lord has done for their small but hardworking radio team. HE finished praying, turned to me and said "Son, what you see and felt during your time with us at NBC Wewak is a testimony of our (staff) commitment to God." Everyone from the DPR down to the driver and support staff, all work together as a team. They maintain communication and remained focus to face everyday challenge. Even they look after what little equipment and resources they have. They understand the economic crisis PNG government is facing and they knew if would be very hard to replace equipment if we don't look after them. NBC East Sepik is a shining example of good prudent management and leadership by the provincial management team. The DPR has good working relations with the provincial government and that is maintained through continuous funding support from the provincial administration. 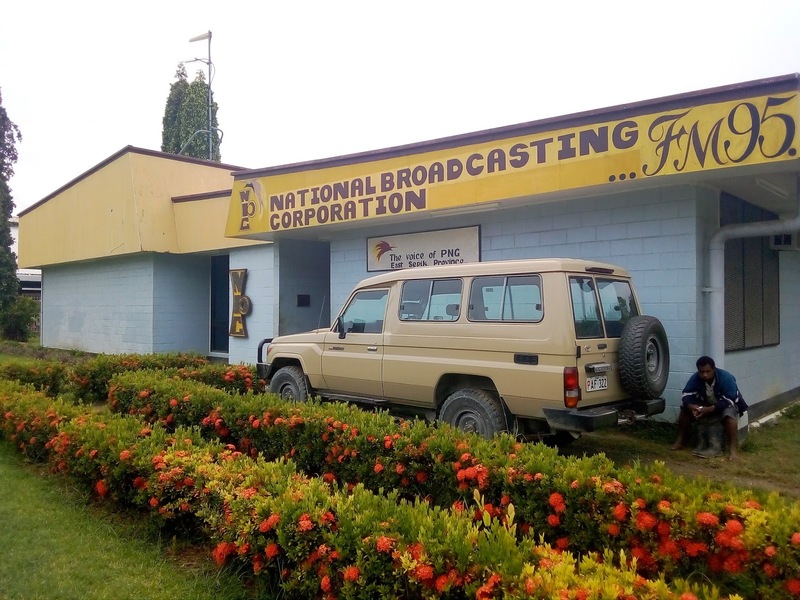 If there was one radio station that I would recommend to be the role model for NBC provincial stations throughout PNG, that would be NBC East Sepik. To all my hardworking colleagues across the country, we all need good managers at the provincial level. If we are serious about rebranding and moving forward with the expectations of the people that relies on us for news and information. We are NBC, we are the voice of Papua New Guinea, lets all stand united and learn from each other's successes to build our beloved nation.